Image used for illustrative purposes. 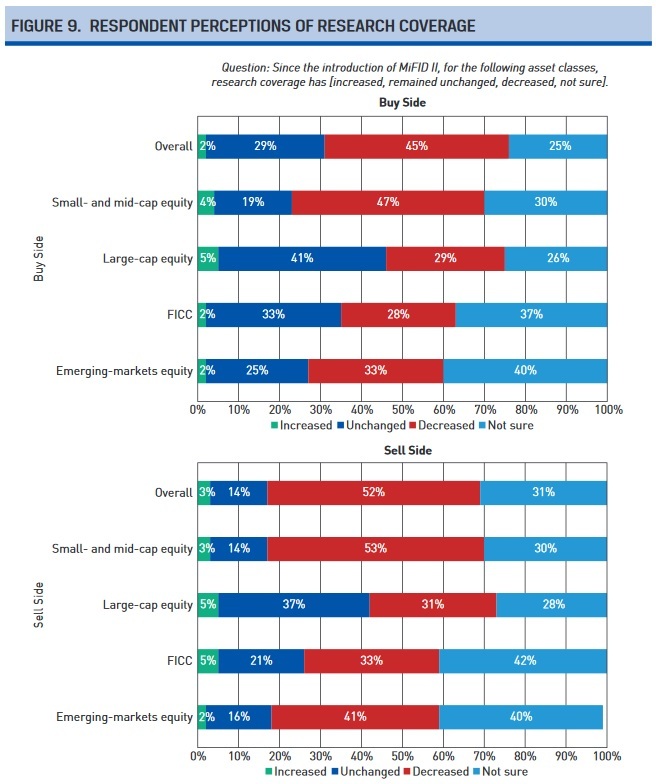 European regulations brought in last year to separate equities research from brokerage activities has led to a decrease in both the amount and quality of coverage - particularly of small- and mid-cap stocks, research from the CFA Institute has found. MiFID II (markets in financial instruments directive), which came into force in January 2018, was aimed at making Europe's financial markets safer and less opaque. The directive contains several provisions, including introducing more transparency in the pricing of over-the-counter (OTC) products not traded on exchanges, capping volumes on "dark pools" of equities traded, and unbundling the cost of research from trading execution fees. Historically, many brokers and investment banks offered research for free as an incentive to clients to trade through them, but Rhodri Preece, head of industry research at the CFA Institute, explained that the rationale for unbundling the service was to allow for a proper price discovery process for equity research and to prevent the production of unnecessary research for which clients ultimately paid through commissions to brokers or fund managers. Yet the institute's survey found that after a year under the new rules, most firms have decided against charging clients directly for research and have instead absorbed the cost as an operational overhead. Some 65 percent of firms with assets under management (AUM) of less than €1 billion said they paid for research - a figure that increases to 84 percent among the largest institutions with AUM of more than €250 billion. This has also led to many looking to cut costs incurred on research. The report surveyed 496 employees across 449 firms in 25 European countries, with respondents working both on the buy- and sell-side of equities trading. This found that across the board, firms cut their research spending by an average of 6.3 percent. For firms with AUM of more than €250bn, the average reduction was 11 percent. Some 57 percent of buy-side firms said they were sourcing less research from investment banks. "The bigger firms are making the bigger cuts in their budgets, which suggests that maybe they have more bargaining power with research providers, maybe there is a sense that big firms are able to substitute their own research for external research," Preece told Zawya in an interview in Dubai. He was in the region presenting the CFA Institute’s findings and spoke to Zawya prior to an event jointly hosted by the institute and the Middle East Investor Relations Association. The impact of the budget cuts, according to sell-side analysts, has been a worsening in the breadth and quality of research, and even analyst job cuts. "Less than 10 percent of respondents say quality has improved," Preece said. Although few on the buy side reported a change in research quality, “the sell-side are saying it's decreased, particularly in the small- and mid-cap space”. “The sell side are the ones feeling the impact of the rules the most, because jobs are being cut, there's arguably a trend to more junior analysts being employed and those respondents feel that quality is suffering,” said Preece. One positive note from survey respondents was that 39 percent of respondents said the market is now more competitive, as opposed to 25 percent who felt it was less competitive. (Source: MiFID II: One Year On, CFA Institute). When asked why a lower amount of small- and mid-cap research might be a problem, especially if clients were unwilling to pay for such research if they deem it unnecessary, Preece said this could be more of a concern to the small- and mid-cap companies themselves as opposed to investors. "If they have fewer analysts covering their stock, there's less information, less liquidity, their cost of capital goes up and it becomes harder to raise money publicly if you haven't got analysts covering your stock," he said. "Bigger companies have got plenty of analysts, plenty of liquidity. Smaller firms coming to public markets, if no-one's going to cover them, maybe they'll think, 'why go through the costs of an initial public offering? We'll stay private’." He said that if companies can't persuade analysts to cover their stock, they may commission their own research. "The rules allow that. But I think it's an open question as to how objective that information is going to be. If asset managers have to rely more on company-sponsored research as a substitute for broker research, that would be a concern." A November 2018 survey by Greenwich Associates into the impact of MiFID II on research budgets found that the biggest European equity investors had cut external research budgets by around 19 percent, estimating a one-off hit of around $300 million for 2018. It also said that the cuts had meant global investment banks effectively increased their market share over brokers and other research providers. Despite this, the Greenwich Associates report argued that “the worst is likely over” in terms of budget cuts, stating that of 209 portfolio managers and 155 traders at European institutions it interviewed, expectations were that budgets would only fall by a further 5-6 percent this year. “The next few years will serve as a rebalancing period for investment managers in Europe, and drastic cuts in budgets mean that portfolio managers now have less stock research informing their investment decisions,” the report warned.